Prospective homebuyers are now just as concerned about energy efficiency as they are about granite countertops and hardwood floors. Many would-be buyers know that 16 percent of all greenhouse gases in the United States come from homes. That is why many of America’s leading builders – including KB Home, Lennar, and PulteGroup – are now part of the EnergySmart Builders program and are committed to providing Home Energy Rating System (HERS) scores for every home that they build. The HERS rating is a “How low can you go?” metric. Whereas most existing homes have energy efficiency ratings of around 130, today’s new HERS-rated homes have an average score of 62. Every point drop is equivalent to a one percent increase in energy efficiency. That means a new HERS-rated home is nearly 70 percent more energy-efficient than a home built in the early 2000s. Government mandates are pushing HER scores increasingly lower. For example, California has enacted legislation that requires all new residential construction to be Zero Net Energy by 2020, which means that each new home must have a HERS score of zero. California continues to be an early adopter of strict energy codes; expect other states to soon follow suit. There are now more than two million HERS-rated homes in the U.S., and major builders have done well by educating customers about what those numbers mean. Switching a home’s lighting from incandescent to LED can sometimes lower a HERS rating by up to five points. The same can be true when you switch from a standard 50-gallon water heater to a heat pump water heater. Selecting the right water heater can help a builder significantly lower a home’s HERS scores to better meet homebuyer demands for higher energy efficiency. Some builders overlook water heaters in their efforts to lower HERS scores. They focus instead on switching the lighting specs to LED – or using higher efficiency HVAC equipment. However, water heating is the second largest energy expense in a home after heating and cooling. According to the DOE, water heating in 1978 accounted for about 14 percent of a home’s average energy consumption. Today that number has risen to about 20 percent. Homeowners may want multiple body-spray showers, for instance, and may not know that a standard 50-gallon water heater is not adequate. Increasing water heater performance and energy efficiency is more important than ever. Custom homebuilders already know a lot about water heating expectations because their customers come to them with specific technologies in mind. Some have done their homework by using resources like the A. O. Smith Product Selector and by searching for sizeable utility rebates. In contrast, production builders have to focus on the big picture: What is the best water heater we can use for this planned 100-home community? Here is the good news: You do not have to be a water-heating guru, or know the difference between condensing and non-condensing technology, to make wise choices. But it is good to know some basics to better serve your customers. If you are looking to simplify the decision-making process, find a good partner or representative network you trust with knowledge about the full suite of water heater technologies in the marketplace, from standard tank to heat pump to tankless. for the specific area and build. For instance, A. O. Smith estimates that 20 to 25 percent of new homes nationwide are being built with tankless water heaters. We also know that more than 80 percent of U.S. homes receive water that is considered hard-water with a high mineral content. This water can be detrimental to tankless technologies and homes in certain areas will require more than the recommended annual maintenance. In these cases, a builder may prefer to opt for a tank-type solution that is often more flexible in hard water conditions. Tankless water heaters are not the only high efficiency option. In California the expected shift will be from tankless to heat pump water heaters. Heat pump water heaters are exceptionally energy-efficient. The message to homeowners is simple: For just pennies in your monthly mortgage cost, you will get dramatic monthly savings. For every kilowatt-hour of electricity that heat pump water heaters use, they produce two or more kilowatt-hours of hot water. Heat pump water heaters are a smart choice for builders in locations that are enacting Zero Net Energy codes because they can be powered by photovoltaic solar systems. Heat pump water heaters are increasingly being used to store solar panel energy that exceeds what batteries can hold; heat pump water heaters take most of the day to recover, but do it quite efficiently. Both production and custom builders can greatly benefit from keeping things simple in water heater selection. Whether the project calls for electric or gas, have a standard option ready, plus a recommended upgrade if a homeowner requests it. Tell your customers, “Here is my tank recommendation, my tankless choice and my recommended heat pump water heater.” Then make sure that your plumbers size the water heaters correctly, that way, you can maximize the full load of the units and ensure higher efficiency. Today’s homebuyers are not experts in water heating technology, but they do understand the financial and environmental benefits of higher energy efficiency. Many buyers are surprisingly knowledgeable about HERS scores. They will appreciate knowing that water heater efficiency can help lower those scores just as significantly as making HVAC and lighting improvements. 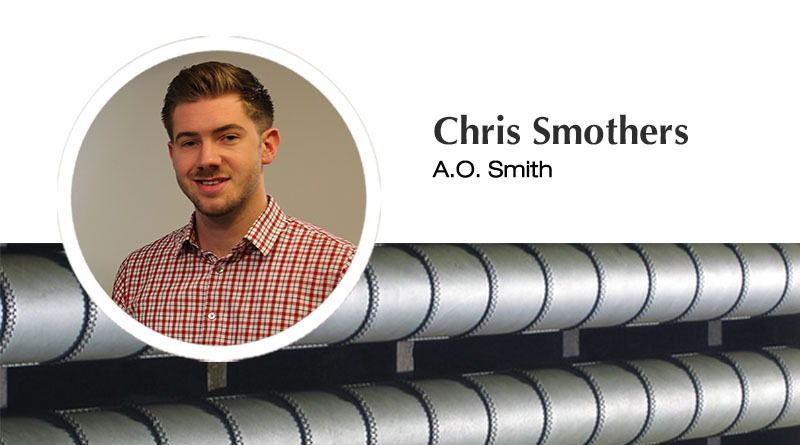 Chris Smothers is Residential National Accounts Manager at A. O. Smith.